Cable for Plug&Play rear view camera connection in Toyota with MFD GEN5/GEN6 displays with DVD navigation without damaging car wires. Image from the camera will be automatically displayed on the screen when reversing. The device is connected to the 24 pin socket. After connection all OEM functions which work using this socket are preserved. 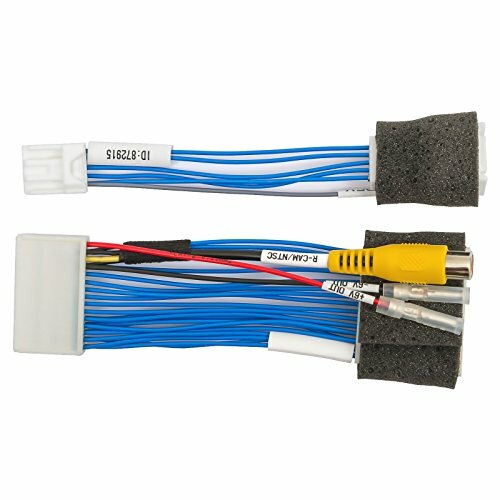 A special cable for rear view camera functionality activation is included in the package content. It's designed specifically for cars where rear view camera functionality was not included by the manufacturer (rear view camera activation signal was not implemented in the head unit). Note! The additionally installed rear view camera should be powered from ACC line (first turn of the key), otherwise the camera input will not be active. Depending on the type of connected camera, namely on the voltage required for the camera, you can use input voltage +6 V, which the monitor produces. In case the camera requires more than +6 V, connect its power to ACC line. Only cameras in NTSC format are supported. Toyota 2DIN are factory car radios with unified 200×100 mm dimensions. The model is indicated on the car radio panel. If you have any questions about this product by Germes Lab., contact us by completing and submitting the form below. If you are looking for a specif part number, please include it with your message.